I have never understood the draw of sriracha. Probably because I've only ever tried store-bought which seems designed to do nothing but sear your face off. I think I'll give your homemade version a try. My husband will definitely love it even if I'm too much of a wimp! I hope you enjoy the sriracha, Brooke! It is indeed spicy, but the flavor of homemade is so fresh and delicious you might enjoy it stirred into mayo to temper the heat - awesome with a grilled cheese sandwich! I love, Love, LOVE Sriracha ~ I put it on just about *everything* so I can't wait to make this and see how it compares!!! Thanks for sharing the recipe! Odd. Sriracha is what I use when I'm not in the mood for spicy... it's the epitome of a mild hot sauce. Oh my god Howie, your taste buds' heat receptors are so resilient! Do me now. Can i used another type of hot pepper besides red jalapenos? i've got some panamanian peppers in my garden that i make another type of hot sauce with. i'm out of the rooster sauce and am getting desperate! 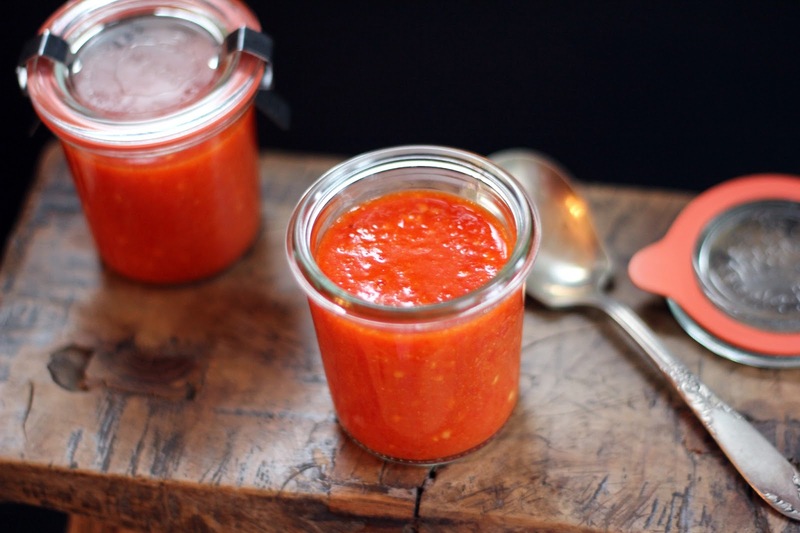 You made a homemade sriracha sauce! WOW that's so impressive!! I'm really surprised to see the simple ingredients here and it's so healthy compared to the bottle version. Unfortunately kids and I cannot eat spicy food, but my husband will adore this sauce till the last drop of it. :D Amazing recipe! Thank you, Nami! True, when you look at the ingredients there really is no comparison between homemade and store-bought when it comes to flavor and health. I hope your husband enjoys it! I love Sriracha sauce and it's a regular in my refrigerator. I wonder why I never attempted making it myself :) This recipe looks so simple. I'll surely stop buying it! No way! I am doing this ASAP. I live on Sriracha and would much rather have a homemade version. Where do you get the red chilies here? I totally love sriracha. Practically the only restaurants we go to are Thai or Vietnamese so I end up consuming a lot of it. I think it's awesome you make your own! Yum. Thai and Vietnamese are at the top of my list of favorite cuisines, so lots of sriracha is eaten both in and out of our house, too. My brother is living in Hanoi and we'll be visiting, so in addition to seeing him and his family I'm excited to eat there! I am mildly addicted to sriracha, but have never made it myself. Between this and the green curry you have got me officially inspired! I have to try this, I am petrified of handling hot peppers (stemming from an incident as a child) but love the idea of homemade sriracha. I love the apple cider vinegar and honey in your recipe. I will muster the courage to handle hot peppers, are the red jalapeno hotter than the green? I am afraid I am a light weight when it comes to knowledge of peppers and heat. Do you use the red for the color or because they have a more intense heat? I understand your hesitation to handle hot peppers, Suzanne - I've had some scorching experiences, too. You may want to try wearing disposable gloves while chopping - I keep a box stashed in the kitchen for times like this (or when I'm prepping trays of ready-to-eat food...goes back to my days of cooking at Hillel). That way, you strip off the gloves and have no worries of rubbing your eyes later. Fresno chiles have a similar heat profile to jalapenos, but are less meaty and have a slightly different shape. I love their flavor and color and use them in other dishes, as well. Good luck and please let me know if you make some sriracha! NICE. I definitely need to make up a batch of this--especially because our Asian market has super-cheap & abundant fresno peppers! Thank you, Eileen! You are fortunate to have a ready supply of fresnos - I have to hunt them down sometimes. I do hope you enjoy the sriracha! My husband is a sriracha addict and eats it daily, he especially likes the garlic version. I will make this asap for him! Never thought to make this at home. We love sriracha and will definitely give this a try! Nice photographs and blog! Thank you so much, Jessica! I hope you like the homemade variety as much as we do. I appreciate you stopping by! Next: ghost pepper sauce ! This is awesome I can't wait to try it. I have a bottle at work, but fresh would be so much better. Also I'm from San Francisco so I should be able to get Fresnos pretty easily no ? Oh wow, ghost pepper sriracha...now there's something to ponder! You should be able to locate fresno chiles easily since they are grown in abundance in California, and I think are even named after Fresno. I hope you enjoy the homemade (and start keeping a jar at work as my husband does!). Thank you, Allison! Little jars of Sriracha would be terrific to give. Homemade gifts are just the best, and it's nice to have some savory options to include alongside the sweet treats. I'm happy you stopped by! How fun, Hannah! I'm not big into Sriracha (except on my pho! ), but I love making condiments at home. It's so easy! Happy to hear you like making condiments at home, too, Christie! Aren't they marvelous? It's such a pleasure to make them (and know exactly what's going into them, as well). Homemade sriracha has to be so much better than store bought. I haven't seen Fresno chilies in our area...I'll have to check into that. I hope you can find Fresno chiles, Karen. They are sometimes labeled red jalapenos (although they are not actually jalapenos, but are similar in size/shape). They are in a couple of our grocery stores and Asian markets here. Please let me know if you make the sauce and I hope you like it. Do you know if you can preserve this recipe using basic canning techniques? Would love to make a large batch on one of those days when the whole jalapeno plant ripens at once. Hi Jon, Making a huge batch is a terrific idea - especially with homegrown chiles! I haven't preserved this sauce before, and I'm not sure about the ratios involved for canning it. Someone else commented about pressure canning a similar sauce when the pH isn't known for sure. I do know that the sauce keeps for quite awhile with all the vinegar and chiles in it. I hope this helps (and that you enjoy the sauce if you make it). Congrats on being featured. Your photos are great--you are turning into the condiment queen! I too love making homemade condiments. I've made something similar and canned in my pressure canning (just to be safe since I don't have an accurate way of measuring the pH). I find the canning tempers the chilies a bit, but still quite delicious. That's a terrific idea to pressure can! I haven't preserved my batches for long-term keeping before, but I'm giving some thought to a pressure cooker and this is one more reason to get one. Thank you for the tip! I'd love to can this too! What pressure and time did you use? My name is Leah Rodrigues and I am a contributing editor on Foodista.com. 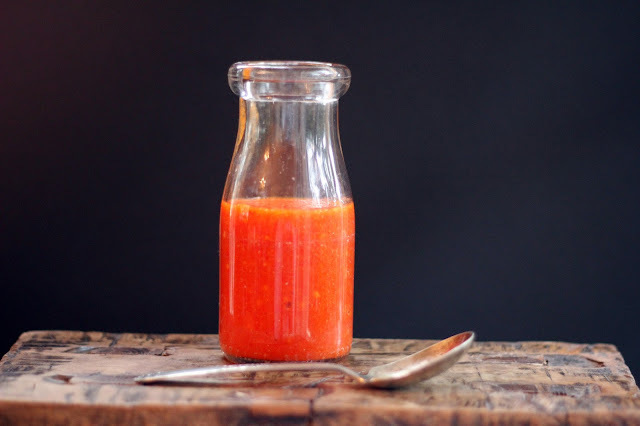 We featured your recipe for homemade sriracha on our website. The post included a photo (crediting Blue Kale Road) with a link to your website for recipe instructions. If for any reason you would like me to delete the post, let me know as soon as possible. I am so impressed!! my husband loves sriracha. I might have to share this recipe with him! Thank you, Alex! I hope your husband enjoys it. And I hope 2013 is off to a lovely start for you! Hmmm. Just made this, for the most part It's terrific. However te. Abundance of apple cider vinegar is too strong for me, will this dissipate by tomorrow, or by giving it time to get cold? Hi Max, I'm so glad you made the sriracha! The vinegar and chile flavors should mellow together as it cools. I often find that when the vinegar is hot after simmering our house is filled with the scent and it can be a bit strong. Try tasting the sauce after a night in the fridge and see what you think - please let me know your thoughts then, too. I appreciate your feedback and do hope you like it! I'll report back tonight! Thanks, Hannah. Love it!! We're a sriracha-obsessed household so I will have to give this a go! Thanks, Katherine! Happy to know you're a sriracha lover, too. I hope you enjoy this homemade version! I just love the world of hot sauces. Harissa has become a favorite, too - just made the one in the new book Jerusalem ... wow! Love the vibrant color of your sriracha! I think this would taste great over grilled tri-tip! Mmm, I agree, Laura - that sounds wonderful! I had no idea this would be so easy to make! All your condiment recipes are eye opening. I am certainly going to try this one soon. I'm delighted to discover so many sriracha lovers, Amy! I do hope you like this homemade version, and I'm happy you stopped by here. Hi Hannah - I love this post and recipe I have to try this - we are hooked on the stuff. My husband bought me a I heart Sriracha tshirt and sometimes I wear to the gym. You would be amazed how much conversation it generates from strangers. We cannot wait to try this recipe. Only we'll be substituting habs or bhut jolokia (ghost) peppers. Love, love, love the taste of sriracha but since we're hooked on the super hots, it's never hot enough for us. Now it will be. Time to take this recipe up a notch or 10!!! Wow, Pam, I can't wait to hear how this turns out - please let me know! Ghost pepper sriracha...ohhh yeah (plus it just sounds so cool). You are inspiring me! can you can it? I know it will take some of the freshness out, but would like to make a whole bunch so if i can it it would last. seems to have enough acid and salt. Hi, I'm not sure about canning since I haven't preserved this sauce before - sounds like you are more familiar with canning and the ratios needed. I do know that the sauce keeps for quite awhile with all the vinegar and chiles in it, although perhaps not long enough if making a huge batch. Someone else commented about using a pressure cooker to can sauces like this one - not sure if this is an option for you and what ratios are required. I hope this helps, and if you make the sauce and can it please let me know how it all goes. I appreciate you stopping by! My husband and I live in South Africa and have never tasted this sauce, and can't seem to find anyone that imports it. He LOVES any kind of spicy food and hot sauce and has been on a mission to make some, because everybody is going nuts for sriracha. So I shall be making your sauce tonight. Very excited to give it try. I'm delighted you made the sriracha, Bailey Rose! Thank you for letting me know. I appreciate you sharing your ideas for tweaks - the longer fermentation time is appealing. Please let me know your results! And a smoky sriracha sounds quite tempting...I may have to try that. I'm happy you stopped by! Just to clarify... is it 12 oz of peppers by weight? Or is it more by volume? I used about 6 oz jalepenos by weight, and it filled my entire mason jar, sliced. Thanks for this recipe!! Hi! The 12 ounces of peppers is by weight. I hope you enjoy the sriracha and I'm glad you stopped by! The flavour is good, but too vinegary compared to actual sriracha. This version works best as something added to sauces and stir-fry for an extra kick. Once I've used all of this batch, I'm going to do what Bailey Rose suggested, though I think I'll use a variety of other peppers as well so that I can get a menagerie of flavours in it. 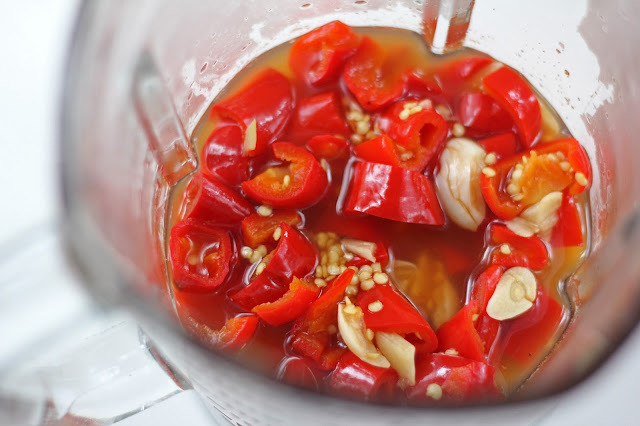 For other readers, this is a great starting point for your homemade pepper sauces. Simply adjust the recipe according to your needs. High vinegar is better for use as a sauce/flavour enhancer; low vinegar is better for use as a condiment/dressing. Hi, I'm delighted you made the sriracha! I appreciate you sharing your experience. The vinegar in this recipe can definitely be modified to suit your taste. I like your idea to use a variety of peppers for a more complex flavor. I'm intrigued with Bailey Rose's suggestions, too, especially fermenting for a longer period of time and I'm planning to do so with my next batch. I'm happy you stopped by! Thank you for posting this! I am going to make this today. Everyone in our house loves the Sriracha and it looks like we can even save a bit of money making it ourselves. We might try ratios of different red chiles for maximum heat benefit. This will be the trinity of good for you, tastes good, and saves resources. Hi Troy, I'm delighted you are making the sriracha! I hope you enjoy it as much as we do. We are hooked on homemade and never without a jar in the fridge now. Please let me know how it turns out for you with a mix of chiles -love this idea. I'm happy you stopped by! Hannah it turned out WAY better than the store bought stuff. Thank you very much for sharing this recipe. I tweaked it by adding one habenero to the mix and using 50% potassium salt and 50% sea salt. The rest of your instructions I followed closely. The honey used was organic. The jar is already half gone and it has only been a few days. Now I am g Marinating overnight time was close to 16 hours. Now I am going to try it with mostly habenero and only a few red jalepeno for a fiery kick to see how it works. Thank you again! I'm so glad you like the habanero mix and I'm curious to hear your results with whey. Keep me posted and happy fermenting! Pretty good in and of itself, but I don't think it tastes very similar to real sriracha. Sriracha is fermented hot sauce. The apple cider vinegar is much to overpowering and semi-sweet. Still a great hot sauce though. Hi Tyler, I'm delighted you made the sriracha and appreciate you letting me know. The amount of vinegar could be adjusted to suit your taste - perhaps decreasing by a 1/4 cup or so, which would also yield a thicker sauce. You're right, traditional sriracha is fermented so this is a quicker version. Sometime I'd like to try making a fermented one - I love hot sauces and am always eager to experiment. I'm happy you stopped by! Hi Hannah, great recipe! I was wondering where you got those pretty mason jars that latch on the sides... or if they have a special name so I can look up where to get a few? Thank you! Hi Clo! Thank you so much. The jars are Weck jars (http://weckjars.com/) and can be found at Crate & Barrel or Williams-Sonoma, or online. They have a variety of sizes/shapes. Lots of fun to fill and use! I'm happy you stopped by. Thank you! Will definitely check these out! Anything homemade that I love is for me! So glad I got here! I will be making some of this! Thank you. I hope you enjoy the sauce, Vetty! Homemade condiments are always so good. Thank you for stopping by! I made this last week and it was a hit! It doesn't quite have that Sriracha taste, but it is some good stuff. Mine was a little vinegar-y. I might try less vinegar as a next try. I did substitute regular honey for the raw honey, but otherwise followed the recipe pretty closely. Would that make it more or less sweet do you think? Hi Joe, I'm delighted you made the sauce and appreciate you letting me know! It is a bit different than traditional sriracha in flavor. If you prefer a slightly less vinegar taste you can reduce the vinegar by a 1/4 cup. I've done so and it results in a little thicker of a sauce. I don't think there are significant differences between regular and raw honey regarding sweetness. I like the flavor of the raw honey that I get at our farmer's market, which is why I use it, but regular honey can definitely be used. Thank you for your feedback! I eat the store bought Sriracha variety occasionally. But I've never tried homemade. Mostly I use powdered cayenne on everything, due to the health benefits; 80,000 HU. I even bought 2lbs of powdered cayenne from Amazon, it's nearly gone. But I still really enjoy this sauce. I will make it tomorrow when I'm off from work. By the way, I am an amateur photographer, and I really like your images. Very colorful, bright, and professional. I'm guessing high end Canon? Thanks for all of your efforts. Johnny C.
Hi Johnny, I appreciate your kind words. I use a Canon 60D and really like it. I hope you enjoy this sauce - please let me know if you have any questions. I'm impressed with the amount of powdered cayenne you cook with! You're definitely a fan of heat. Thanks for stopping by! Would there be a problem doing this with green peppers? Of course, I know the colour would be different. Hi Steve, I can't imagine any issue in using green peppers. You will have a different level of spicy heat depending upon the peppers you use, but I'm sure it will be delicious! I make a green jalapeno sauce that's quite tasty, and have been pureeing grilled hatch chiles lately - so delicious. Green is good! I hope you enjoy the sauce. I'm making it right now with 3 fresnos, 1 habanero, and the rest with green jalepenos. It's a spicy batch that just gets up your nose if you stand too close to it over the stove. Thank you for the recipe. My husband is the kind of guy who puts it on EVERYTHING. Hopefully this will cut down on our grocery bill. He goes through one large store-bought bottle in a week. Hi Cassi! I'm delighted you made this sriracha and I love the combination of peppers you used. I hope your husband enjoys it - he sounds like a true sriracha fan! I'm happy you stopped by. When mine came out it was a bit loose and not very paste-like like Sriracha. So, I just boiled it on low heat for like 15-20minutes and it came out just right...even added a bit more red to the hue! But while it still tasted a little too apple-cider-y, it goes away a little bit when it rests in the jar overnight. Gonna make a few tweaks: more garlic, more salt, hotter peppers, rice vinegar. Thank you so much for this recipe! You are awesome and a true servant of the spicy red rooster! Hi Brian, I'm happy you made the sauce and appreciate you letting me know! Thank you for sharing what you did and your suggestions for tweaks, too. I'm intrigued by rice vinegar and may try that myself next time. I'm delighted to share some sriracha love! Thanks for stopping by. Wow, looks so amazing and simple! 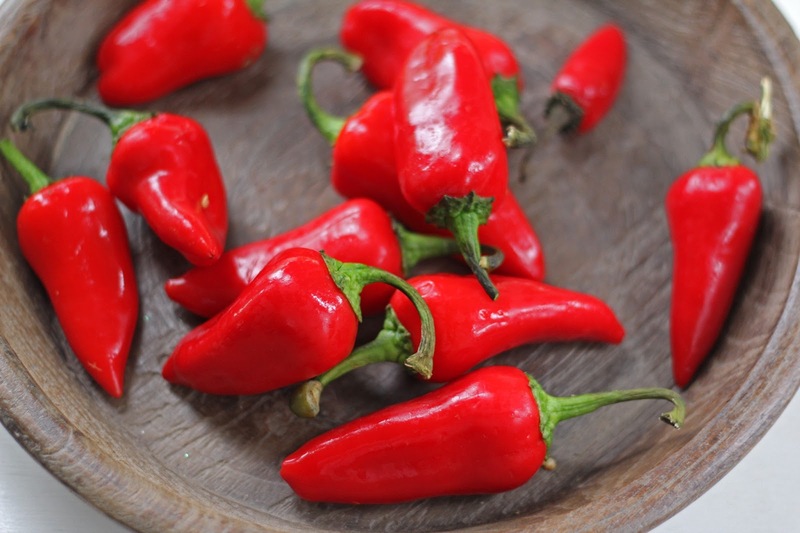 Did you try with other types of chillies - which ones worked best in flavour? Thank you, Vlad! I've only made this with red fresno chiles so far, but others have commented and have tried habaneros and/or jalapenos and had tasty results. It is a simple sauce to make and is a staple in our kitchen now. I hope you enjoy it if you decide to give it a try! I'm happy you stopped by. Do you think this could be water bath canned? Hi Jen! I don't have an accurate way to measure the pH so I'm not sure if this would be safe for water bath canning. I do know that it keeps well in the fridge for a month or so, though. I hope you enjoy the sauce if you decide to make it! Thanks for stopping by. Could i use Thai bird's eye chilli instead of the red jalapenos? They are obviously much hotter, would that be a problem? Hi Pieter! You could use the same weight of Thai chilis and I think the sauce would turn out well. The flavor would be a little different and definitely much more fiery. I hope you enjoy it if you make it! I'm happy you stopped by. I'm giving this a shot for red and green sauces. Gonna drop in a few ghost and scorpion for heat though. I'm happy to hear you're making this, AJ! Sounds like you'll have a very fiery sauce with the added peppers. Enjoy! You have to be careful when making pepper sauces. If you don't sterilize things properly, it can be deadly. I don't have a kitchen scale at home, approximately how many peppers should I use? Also will this recipe be as hot as Sriracha sauce or hotter? Hi, I usually weigh my peppers at the store, so I don't have an accurate number to give you. Hopefully your store has a scale you can use. I'll have to count the next time I buy some! The sauce is pretty similar to the heat of sriracha. It will also depend on how hot your peppers are - fresh peppers can vary a bit. I hope you enjoy the sriraacha! I'm happy you stopped by. OOoooh and no fish oil like the store-bought kind! I can eat this as a vegan!! Thanks for the recipe, love it! Very good. I couldn't find the red peppers so I used jalapenos and 2 habanero. I loved it! Thanks for sharing this recipe. I made this twice last year using different combinations of peppers, and it does keep a pretty long time (although I go through it quickly because I put it on everything). However, I've always kept it in the fridge but I want to make some to mail to a friend. Do you think it will make it alright assuming it takes up to a week? I've been making this (using various peppers) since you posted this recipe. Looks delicious - where did you get the cute jars? Thank you! The jars are made by Weck and available in some grocery stores or specialty shops. Lots of different sizes!